Automatic Pill Dispenser (996024). Tipper included. No Monthly Fees. Avoid Medication Errors. Feel Better. FREE Shipping. Order your e-pill CADEX Medication Reminder today. Alarm Watch: ALARMS up to 12 Times per Day. Medical Alert: Press ALERT and your CADEX watch tells your medical information. > Is there a cure for forgetfulness (improved medication adherence (reduced medication non-adherence) and better patient compliance? Alarm Watch / Medication Reminders / Medication Adherence / Patient Compliance / Medication Non-Adherence / Pill Timer / Automatic Pill Dispenser / Pill Box / Pill Dispenser. Learn how the popular e-pill CADEX 12 Alarm Watch and other e-pill Medication Reminders can help you remember to take the right medications, in the right dosage and at the right time. Never forget to take your medications again with an e-pill Medication Reminder. Welcome to the CadexWatch.com web site. About CADEX and e-pill: Our popular e-pill� Medication Reminders are used around the world and are routinely used in clinical studies by the pharmaceutical industry to help individuals (patients) improve medication adherence and patient compliance. In the case of an emergency the e-pill CADEX 12 alarm watch can also be used as an Electronic Medical Alert (Medical Alert Bracelet). Never forget to take your medications again. How-CADEX-Works VIDEO. Avoid Medication Errors. CADEX Questions? I always forget to take my medications. The CADEX watch now reminds me morning and night. It even has a snooze feature in case I can't take them right away. "I bought the watch thinking that if I needed to give medical data to a doctor or EMS and couldn't the watch could. I'm a diabetic who has had a kidney transplant. I take many different meds and insulin. The alarms remind me when to take the meds. I am beyond pleased with the watch!" My name is Andrew T., and your watch contributed quite a bit to my recovery from a mental illness. The alarms I entered were not for medication, but for routine. When I was on disability and unwell, my life and schedule were a chaotic mess. My parents purchased the watch for me as sort of a shot in the dark kind of thing. The first alarm I added was a reminder to go to bed at a regular time (after all, if you go to bed at 5 am, no way you�re getting up for a 9 am doctor�s appointment, and if you�re sleeping weird hours, good luck getting on any sort of medication routine). Then I started plugging in reminders for mealtimes, for checking the mail, and other daily tasks. Avoid Medication Errors with an e-pill Medication Reminder. Easy-to-Set e-pill CADEX ALERT Pill Timer Alarm Watch (with up to 12 daily Alarms and Medical Alert) looks like a normal digital watch (not over-sized) and is a great medication reminder. This e-pill watch helps the patient remember to take medications (improves patient compliance and medication adherence). Used in clinical studies by the pharmaceutical industry. Automatically alarms up to twelve (12) times per day - no reset required. Digital SOS: CADEX Watch is an "away from home" medical alert (electronic medical bracelet). Never Forget to take your Medications Again! Over 50,000 e-pill CADEX Alarm Watches sold. ORDER your own e-pill CADEX and get FREE Shipping and a FREE GIFT today (restrictions apply)! Popular e-pill� Medication Reminder Timer Watch with up to Twelve (12) Daily ALARMS, medical SNOOZE (long alarm duration) and medical ALERT (U.S. Patent 6,560,165). Alarm Text Message (optional up to 36 characters) and Beep Alarm (60 seconds PLUS reminder beep until all medications have been taken for up to 4 hours). Watch CADEX Video. 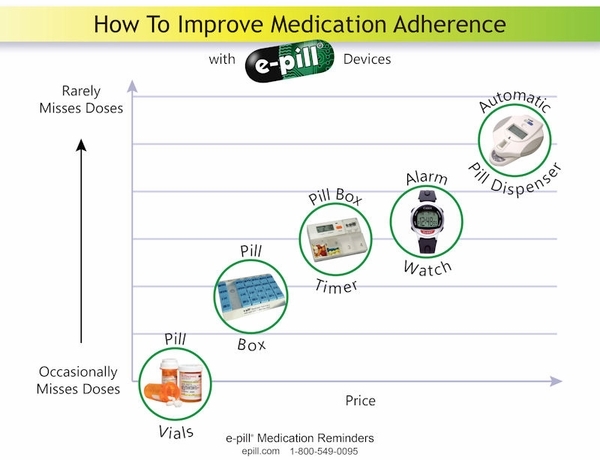 Easy-to-Use practical patient compliance / medication adherence e-pill Medication Reminder device. Never Forget to take your Medications Again! Improved patient compliance and medication adherence helps you feel better and avoid medication errors. Order your e-pill CADEX 12 ALARM Medication Reminder and Medical ALERT Watch today. 30 Day Money Back Guarantee. One Year Warranty. FREE Standard Shipping & Handling. Not Suitable for Hearing Impaired. Do NOT wear in shower or swimming pool. Long alarm duration ('medical snooze') up to 4 hours. Easy to read display, tells time, day of week and date. Medical Alert works like an 'electronic' medical bracelet (medical jewelry). Instructional (Text) Message with each alarm (optional). 12 ALARM Daily Medication Reminder. Long Alarm Duration - up to 4 Hours: 60 Second Alarm + Optional Text Message (up to 36 characters) + up to 4 hours of Reminder Beeps every three (3) minutes until all medications have been taken. No alarm reset required (alarm auto reset). SNOOZE. Reminder beep every three (3) minutes until all medications have been taken (medical snooze). Total alarm duration 240 minutes (up to 4 hours). Optional alarm instructional text message ('TAKE MORNING MEDICATIONS' or 'TOPROL XL 100MG') scrolls across the face of the watch. Medical ALERT ID. May speak for you in an emergency when you are unable to speak for yourself. U.S. Patent 6,560,165. CADEX�, e-pill�, ePill�, PuffMinder�, Accutab� and HIProtector� are registered trademarks.